In this post I am going to talk about radical Muslim terrorists. On a personal note the recent terrorist attack on October 31, 2017 happened as I had one relative in New York about to fly out at the end of the week and another relative on a plane about to arrive in. In fact, many of the 8 victims of the terrorist were not from New York. On July 3, 2016, I responded to our phone call with an email that basically recapped several things that Dr. Bloembergen and I had discussed in our phone discussion 2 days before. I pointed out to him on the phone that day that each religion was different and that in recent history it was Islam fanatics that were guilty of so much killing, and Dr Bloembergen seemed to resist that by saying that Muslims are not getting treated very well. I addressed this in my email of July 3rd that is posted below. So far in 2017 there are have been 1,049 attacks and 6,571 fatalities by Muslim radicals. In fact, on October 31, 2017, Eight people are killed and almost a dozen injured when a 29-year-old man in a rented pickup truck drives down a busy bicycle path near the World Trade Center in New York. The suspect has been identified as Sayfullo Habibullaevic Saipov. Authorities found a note near the truck used in the incident, claiming the attack was made in the name of ISIS, a senior law enforcement official said. April 7, 2017 – At least four people are killed when a truck drives into pedestrians on a busy street in the center of Stockholm, Sweden, before crashing into a department store. The attacker, Rakhmat Akilov, a 39-year-old from Uzbekistan, admitted to carrying out a “terrorist crime,” his lawyer says. June 3, 2017 – Seven people are killed in two terror attacks in central London before police shoot three suspects dead, the Metropolitan police say. The violence begins when a van swerves into throngs of pedestrians on London Bridge. The suspects then jump out the van and proceed on foot to nearby Borough Market, a popular nightlife spot, where witnesses say they produce knives and slash indiscriminately at people in restaurants and bars. At least 48 people are taken to hospitals, according to the London Ambulance Service. Authorities announce 12 arrests the next day. June 19, 2017 – Just after midnight, a van plows into a group of pedestrians who had attended late-night prayers at London’s Finsbury Park Mosque, killing one man and injuring 11 people. The driver is arrested at the scene for attempted murder and further held on suspicion of terrorism offenses. The suspect is later identified as Darren Osborne, 47, a resident of Cardiff in Wales, according to multiple UK media outlets. October 31, 2017 – Eight people are killed and almost a dozen injured when a 29-year-old man in a rented pickup truck drives down a busy bicycle path near the World Trade Center in New York. The suspect has been identified as Sayfullo Habibullaevic Saipov. Authorities found a note near the truck used in the incident, claiming the attack was made in the name of ISIS, a senior law enforcement official said. In the first video below in the 9th clip in this series are his words and will be responding to them in the next few weeks, but today I just wanted to pause and look at this life. I was privileged to be able to correspond with him since the 1990’s and he even called me on the phone. 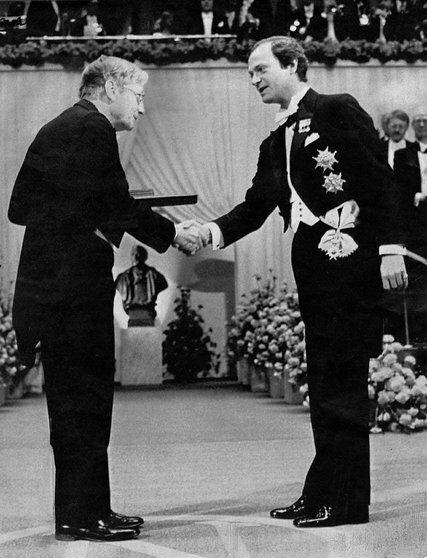 Bloembergen received the Nobel Prize in 1981 for his contributions to the field of nonlinear optics and to the development of laser spectroscopy. He was a corecipient with Arthur Schawlow of the United States and Kai Manne Borje Siegbahn of Sweden of the 1981 Nobel Prize for Physics for their revolutionary spectroscopic studies of the interaction of electromagnetic radiation with matter. Bloembergen made a pioneering use of lasers in these investigations. His research has included nuclear and electronic magnetic resonance, solid state masers and lasers, and nonlinear optics and spectroscopy. His work on proton spin relaxation times in water and aqueous solutions, carried out in 1946 and 1947 under the guidance of his PhD thesis advisor, Edward M. Purcell, later became the basis for the medical diagnostic technique of magnetic resonance imaging (MRI). Bloembergen first came to the United States in 1945, after spending World War II “hiding indoors from the Nazis, eating tulip bulbs to fill the stomach and reading Kramers’ book Quantum Theorie des Elektrons und der Strahlung by the light of a storm lamp.” He received his PhD at the University of Leiden in 1948, after doing research at Harvard, then finally emigrated to the U.S. (and returned to Harvard) in 1949. He and his wife Deli moved to Arizona, and he has been on the UA College of Optical Sciences faculty since 2001. He was interviewed at his birthday celebration by Daniel Stolte of the UA University Communications office, and this video is courtesy of the University of Arizona. Are all religions the same in the area of historical accuracy? I would say that the evidence says NO. For instance, compare the historical accuracy of the BOOK OF MORMON versus the Bible. The Book of Mormon claims to be a record of the inhabitants of the Americas during the period from 2000 B.C. to 400 A.D. It makes many claims about the history and anthropology of pre-Columbian American cultures. Unfortunately, the author of the book, Joseph Smith, had little or no knowledge of pre-Columbian American civilizations. Borrowing and adapting many stories from the Old and New Testaments, Joseph Smith was unaware that the earlier Native American people were part of stone-age civilizations that were significantly less advanced than Hebrew and other Middle Eastern cultures of biblical times. The Book of Mormon describes the presence of chariots in the New World.However, archeologists have found neither evidence of chariots or even evidence of wheeled vehicle usage during the period described in the Book of Mormon. Scimitar (“cimiter”) – not found in the New World Scimitars (spelled “cimeters” by Joseph Smith), were Old-World weapons of war that were mentioned throughout the Book of Mormon.However, they have not been found to have existed in the New World. LDS apologists cite the Mesoamerican maccuahuitl as a possible “cimiter”.However, the maccuahuitl was a hardwood club with obsidian blades, which is quite different from the heavy, two-handed curved steel blade of the “cimeter.” The Book of Mormon expressly states that the American peoples of the period used weapons of war made of metals,although none of these weapons have ever been found. The Hill Cumorah in New York is described as the location of two major wars that involved the deaths of millions of people. However, no remains or even weapons of war have been found there. In contrast look at some of the archaeological evidence concerning the Bible. The Old and New Testaments present a rich description of biblical peoples, places and cultures. Archeology of the Middle East has revealed the cities, weapons, crops, animals, coins, writings, and references to biblical characters found in the Bible. However, none of the cities mentioned in the Book of Mormon have ever been identified by qualified archeologists. In addition, many Book of Mormon references to metals, weapons, crops, animals, articles of clothing are known to have not been present in the Americas during the time period claimed in the Book of Mormon. There is very little doubt in anyone’s mind about the reality of so many of the Old and New Testament cities mentioned in the Bible. Therefore, it is hardly necessary to document their existence. Nevertheless, following is a partial list of some of the cities mentioned in the Bible that have been found and excavated by archaeologists. This is simply more evidence that the Bible describes actual locations that can be verified. This means that at the very least, the Bible accurately reflects the locations and cities of ancient times. Remember, this is only a partial list. There are hundreds of biblical cities that have been verified in archaeological digs. Over the years there have been many criticisms leveled against the Bible concerning its historical reliability. These criticisms are usually based on a lack of evidence from outside sources to confirm the Biblical record. Since the Bible is a religious book, many scholars take the position that it is biased and cannot be trusted unless we have corroborating evidence from extra-Biblical sources. In other words, the Bible is guilty until proven innocent, and a lack of outside evidence places the Biblical account in doubt. This standard is far different from that applied to other ancient documents, even though many, if not most, have a religious element. They are considered to be accurate, unless there is evidence to show that they are not. Although it is not possible to verify every incident in the Bible, the discoveries of archaeology since the mid-1800s have demonstrated the reliability and plausibility of the Bible narrative. Many thought the Biblical references to Solomon’s wealth were greatly exaggerated. Recovered records from the past show that wealth in antiquity was concentrated with the king and Solomon’s prosperity was entirely feasible. It was once claimed there was no Assyrian king named Sargon as recorded in Isaiah 20:1, because this name was not known in any other record. Then, Sargon’s palace was discovered in Khorsabad, Iraq. The very event mentioned in Isaiah 20, his capture of Ashdod, was recorded on the palace walls. What is more, fragments of a stela memorializing the victory were found at Ashdod itself. Another king who was in doubt was Belshazzar, king of Babylon, named in Daniel 5. The last king of Babylon was Nabonidus according to recorded history. Tablets were found showing that Belshazzar was Nabonidus’ son who served as coregent in Babylon. Thus, Belshazzar could offer to make Daniel “third highest ruler in the kingdom” (Dan. 5:16) for reading the handwriting on the wall, the highest available position. Here we see the “eye-witness” nature of the Biblical record, as is so often brought out by the discoveries of archaeology. Author: Bryant Wood of Associates for Biblical ResearchThe Bible maintains several characteristics that prove it is from God. One of those is the fact that the Bible is accurate in every one of its details. The field of archaeology brings to light this amazing accuracy. This clay tablet is a Babylonian chronicle recording events from 605-594BC. It was first translated in 1956 and is now in the British Museum. The cuneiform text on this clay tablet tells, among other things, 3 main events: 1. The Battle of Carchemish (famous battle for world supremacy where Nebuchadnezzar of Babylon defeated Pharoah Necho of Egypt, 605 BC. ), 2. The accession to the throne of Nebuchadnezzar II, the Chaldean, and 3. The capture of Jerusalem on the 16th of March, 598 BC. 2. Hezekiah’s Siloam Tunnel Inscription. King Hezekiah of Judah ruled from 721 to 686 BC. Fearing a siege by the Assyrian king, Sennacherib, Hezekiah preserved Jerusalem’s water supply by cutting a tunnel through 1,750 feet of solid rock from the Gihon Spring to the Pool of Siloam inside the city walls (2 Kings 20; 2 Chron. 32). At the Siloam end of the tunnel, an inscription, presently in the archaeological museum at Istanbul, Turkey, celebrates this remarkable accomplishment. It contains the victories of Sennacherib himself, the Assyrian king who had besieged Jerusalem in 701 BC during the reign of king Hezekiah, it never mentions any defeats. On the prism Sennacherib boasts that he shut up “Hezekiah the Judahite” within Jerusalem his own royal city “like a caged bird.” This prism is among the three accounts discovered so far which have been left by the Assyrian king Sennacherib of his campaign against Israel and Judah. 4. Biblical Cities Attested Archaeologically. Most doubting scholars back then said that the Hittites were just a “mythical people that are only mentioned in the Bible.” Some skeptics pointed to the fact that the Bible pictures the Hittites as a very big nation that was worthy of being coalition partners with Egypt (II Kings 7:6), and these bible critics would assert that surely we would have found records of this great nation of Hittites. The ironic thing is that when the Hittite nation was discovered, a vast amount of Hittite documents were found. Among those documents was the treaty between Ramesses II and the Hittite King. The Moabite Stone also known as the Mesha Stele is an interesting story. The Bible says in 2 Kings 3:5 that Mesha the king of Moab stopped paying tribute to Israel and rebelled and fought against Israel and later he recorded this event. This record from Mesha has been discovered. View from the dome of the Capitol!9A Verification of places in Gospel of John and Book of Acts. I found myself brought into contact with the Book of Acts as an authority for the topography, antiquities and society of Asia Minor. It was gradually borne upon me that in various details the narrative showed marvelous truth. 9B Discovery of Ebla Tablets. When I think of discoveries like the Ebla Tablets that verify names like Adam, Eve, Ishmael, David and Saul were in common usage when the Bible said they were, it makes me think of what amazing confirmation that is of the historical accuracy of the Bible. There is a well preserved cylinder seal in the Yale University Library from Cyrus which contains his commands to resettle the captive nations. 11. Puru “The lot of Yahali” 9th Century B.C.E. This cube is inscribed with the name and titles of Yahali and a prayer: “In his year assigned to him by lot (puru) may the harvest of the land of Assyria prosper and thrive, in front of the gods Assur and Adad may his lot (puru) fall.” It provides a prototype (the only one ever recovered) for the lots (purim) cast by Haman to fix a date for the destruction of the Jews of the Persian Empire, ostensibly in the fifth century B.C.E. (Esther 3:7; cf. 9:26). The Bible mentions Uzziah or Azariah as the king of the southern kingdom of Judah in 2 Kings 15. The Uzziah Tablet Inscription is a stone tablet (35 cm high x 34 cm wide x 6 cm deep) with letters inscribed in ancient Hebrew text with an Aramaic style of writing, which dates to around 30-70 AD. The text reveals the burial site of Uzziah of Judah, who died in 747 BC. 14c. Three greatest American Archaeologists moved to accept Bible’s accuracy through archaeology. Despite their liberal training, it was archaeological research that bolstered their confidence in the biblical text:Albright said of himself, “I must admit that I tried to be rational and empirical in my approach [but] we all have presuppositions of a philosophical order.” The same statement could be applied as easily to Gleuck and Wright, for all three were deeply imbued with the theological perceptions which infused their work. Prominent evangelical leaders are backing religious freedoms for Muslims and other faiths as well as Christianity after a poll highlighted few Americans back civil liberties for Islam. A 2015 survey from the Associated Press and NORC Center for Public Affairs Research found the vast majority of US citizens backed freedom of religion for various groups. But it also highlighted that ‘while 82 per cent of Americans say it is very or extremely important that Christians are allowed to practise their religion freely in the United States, just 61 per cent say the same about protecting religious freedom for Muslims’. In response to the findings the National Association of Evangelicals held its own survey and found church leaders unanimously supported the ‘same religious freedom protection for people of non-Christian faiths as for Christians’. The January 2017 evangelical leaders survey found 100 per cent of respondents agreed the same liberties should apply to non-Christians as to Christians. ‘Evangelical leaders believe religious freedom is a basic human right for all people, and that protecting the religious freedom for people of other faiths is protecting their own freedom,’ said Leith Anderson, president of the National Association of Evangelicals (NAE). President of Wheaton College, Philip Ryken, agreed. ‘The freedom to practise any religion — or no religion at all — is basic to religious liberty. When Christians advocate for religious liberty, we are not seeking a special privilege for Christians, but promoting a basic human right for all people,’ he said. The monthly poll of the Board of Directors of the National Association of Evangelicals includes the CEOs of denominations and representatives of a wide range of evangelical organisations including missions groups, Christian universities, publishers and churches. It is not a representative sample of all evangelical leaders. The sample size was not reported.